Prodigy Audio Systems Ltd was founded in the UK in 1992 by Lenios C Demetriou with the sole purpose of designing and manufacturing products specifically for the Bouzouki, Tzoura and Baglama. Prodigy Audio Systems products are distributed in the UK, mainland Greece and Islands, Cyprus, USA and other parts of the world. Lenios is a classically trained musician, having attended the London School of Music and later studying at the London College of Music, specializing in the violin and theory of music. At an early age he became interested in the Bouzouki and was to be seen backing up a number of well known Greek singers in many of the prestigious Greek nightclubs in London. He soon made a name for himself as both a reliable and highly talented musician, gaining a great deal of respect from both his fellow musicians and his audience. In later years he became a sought after session musician working for people such as Randy Edelman, Julian Mendelsohn, Nigel Wright and Barry Blue to name but a few. Television also beckoned and he found great pleasure in being able to bring the Bouzouki to the fore in western music while still maintaining its native Greek traditions. Lenios has had the honour to have performed for the Greek Royal Family. He has also performed for Her Majesty Queen Elizabeth II and Charles, Prince of Wales. 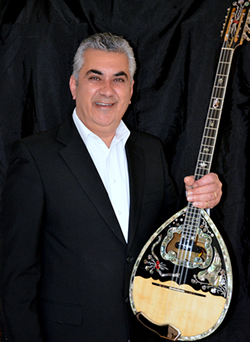 It was through his many years as a highly rated Bouzouki player that he felt that a more superior sound quality for the Bouzouki could be attained both in live and acoustic climates and out of this belief Prodigy Audio Systems Ltd was born, in the process creating the brands Bouzouki Prodigy, Prodigy Strings and Prodigy Plectrums. For many years Bouzouki players worldwide were using strings, pickups, straps etc, which were originally made for other instruments such as the guitar & saxophone. Prodigy Audio Systems Ltd has changed all that. We are a company that designs and manufactures products to a very high standard with quality at its pinnacle, specifically for the Bouzouki. Prodigy Audio Systems Ltd has the passion energy and drive to continuously build on new ideas and go through the challenging and demanding process of the various experimental stages and developing and expanding new products. For years Prodigy Audio Systems Ltd has been raising standards on Bouzouki products and setting new trends in everything it does from finding new ways of packaging its strings to the sounds of the pickups. We were the first company to introduce a battery operated pickup for the Bouzouki; an ‘Active’ pickup which was named the Bouzouki Prodigy ‘S8’. We have set an even higher standard for others to follow with the remarkable Bouzouki Prodigy ‘ m 8’ Active Bouzouki Pickup. With our many years of experience and our reputation for quality products, Prodigy Audio Systems Ltd will continue to provide the best strings, pickups & accessories for Bouzouki players worldwide for years to come. When looking for a very high quality performance from your Bouzouki, give it what it deserves. Look to Bouzouki Prodigy, the brand created for the Bouzouki. The world’s top Bouzouki players endorse our products. This web site is dedicated to my late father Costas Demetriou a violinist by nature playing in the Greek Traditional Style, who encouraged and supported me throughout my playing career, especially with Prodigy in its infancy stage. Play Bouzouki Prodigy and ENJOY!